In the photograph I’m holding, it’s 1982. A young, bearded man stands alone in a parking lot, looking for all the world like a bon vivant in slim pants and boots. “That was all my belongings,” Lester Rodzen tells me. “The clothes on your back?” I ask. Thus was the figure in the photo equipped to escape his Communist-run homeland with less than 24 hours’ notice after being identified as the printer of an underground newspaper. Spending a year in an Italian refugee camp while the United Nations processed his paperwork, Rodzen eventually made his way to New Jersey; from there, he planned to join some friends in San Diego, but “my car was broken in Denver & I stayed for the next 26 years.” Now the former petroleum chemist is the owner of Westminster Polish restaurant Cracovia. You think all that’s exciting? Try the food. 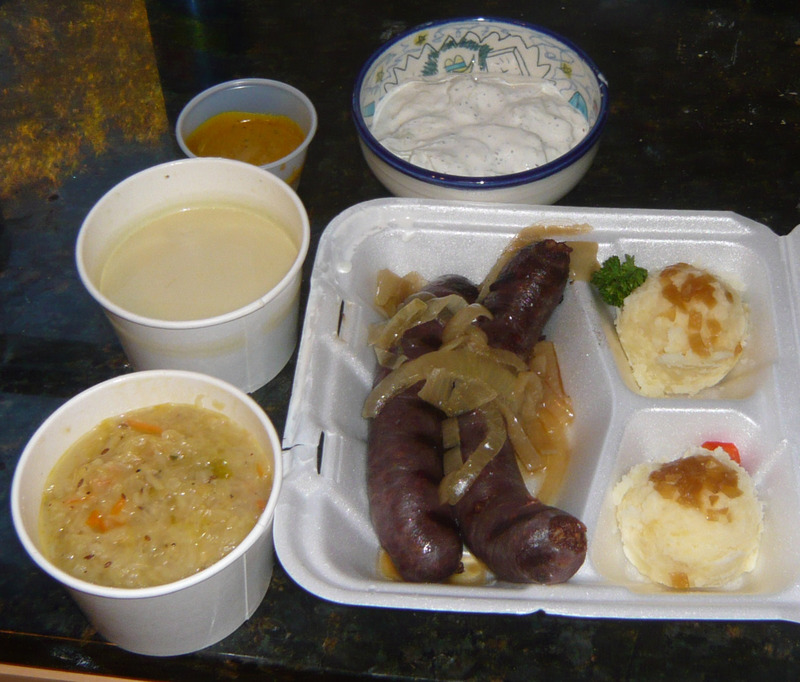 Okay, Polish cuisine isn’t really known for its pizzazz; rather, its hallmark is homestyle comfort, all meat & potatoes, dumplings & root vegetables, boiled this & pickled that. But if you’ve got a taste for such substantial stuff, then exhilarating it most certainly is. And while the likes of pierogi & kielbasa are celebrated worldwide, it’s the lesser-known kiszka that gives me a thrill. 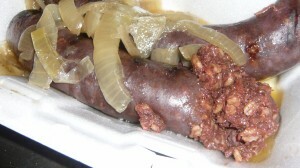 Put gently, kiszka is black pork sausage; put bluntly, it’s blood sausage. Compared to much of its firmly packed ilk, the forcemeat (that is, the ground, spiced mixture inside the casing) is loose & grainy. And though well-seasoned, kiszka is surprisingly mild—nutty with whole kernels of barley & devoid of the iron-tinged aftertaste you might expect. It comes with mashed potatoes & warm sauerkraut—which is strikingly sour indeed, but also richly brothy & studded with caraway seeds. It does not, however, come with the homemade mustard that Rodzen pairs with his white sausage—understandably, since the almost orange, tangy sweet-hot condiment could easily overpower its own delicate flavor. But I request a side of it anyway to polish off (no homonym intended) with a spoon. It’s that good. Also pictured are zupa ogórkowa & mizeria, both bound to be acquired tastes for many Americans. The former is described as “pickle soup with potatoes”; more accurately, it’s potato soup with shredded pickles—milky on the one hand, sharply sour on the other. Being staunchly pro-pickle myself, I get a kick out of it, though skeptics aren’t likely to be swayed. The same goes for mizeria, the classic salad—which is more like a cold soup—of sliced cucumbers in sour cream, seasoned simply with salt, pepper, & dill. Though refreshing, the ratio of dairy to veggie might come as a shock to leaf-eaters. Then again, such specialties just go to show that Rodzen & his co-owner, wife Maria, aren’t dumbing their cookery down a whit for the uninitiated. This is a very good thing. Go in with an open mind and you’ll be rewarded with a delightfully expanded belly. Cracovia: 8121 W. 94th Ave., Westminster; 303.484.9388; Lunch and dinner daily; $7.95-$20.95.